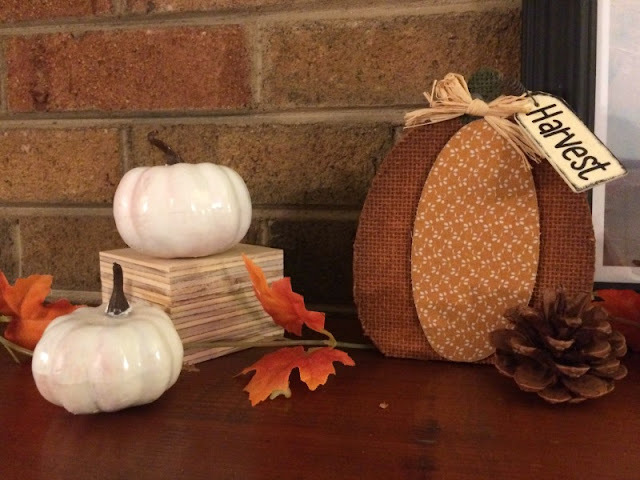 School is back in session and the mornings are getting a little cooler, which means it is time to break out the pumpkins and fall decor. 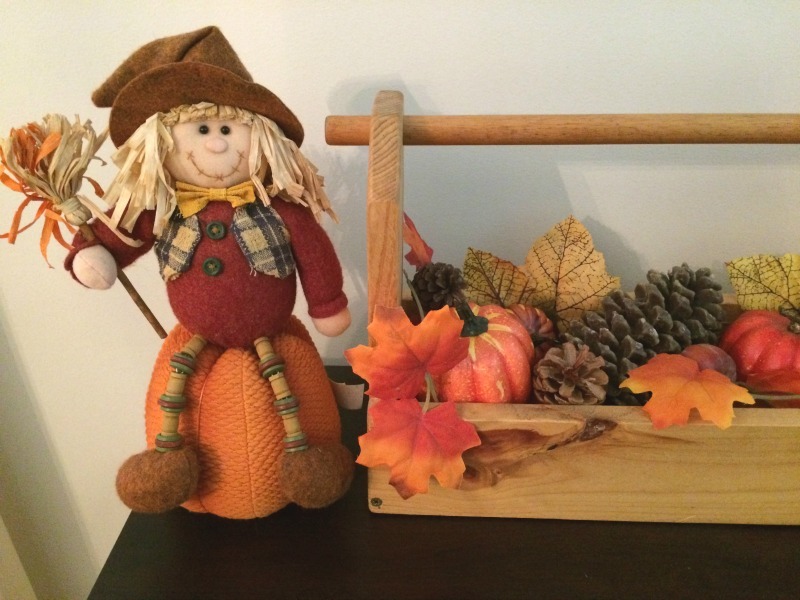 I enjoy mixing neutral shades with the traditional orange and yellows of fall to create a rustic feel in my decor. 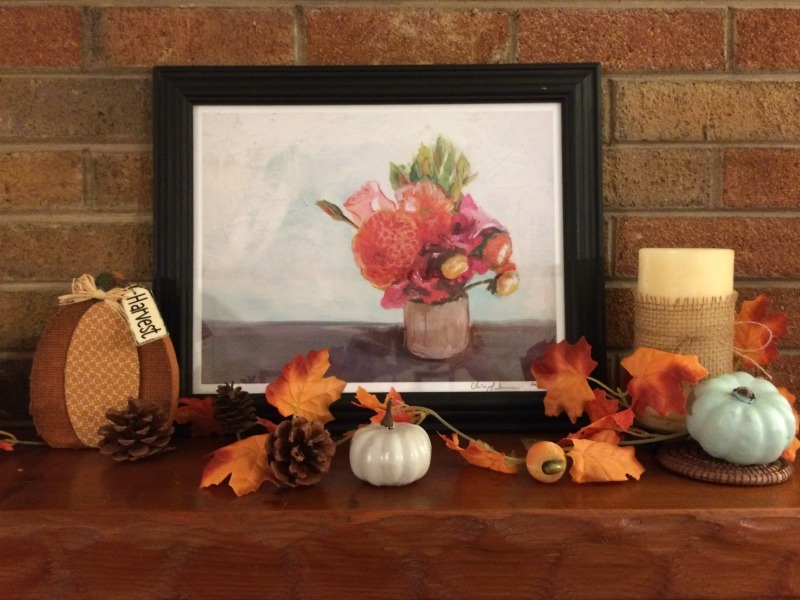 I styled my mantel around Mai Autumn's Summer Bouquet Giclee Print that I won from a giveaway over at My Turquoise Home. It has all the perfect fall colors in it. I used my teal and white painted faux pumpkins to offset the bright fall colors in the leaf garland. I brought in some rustic details by wrapping a candle and mason jar with burlap and twine. 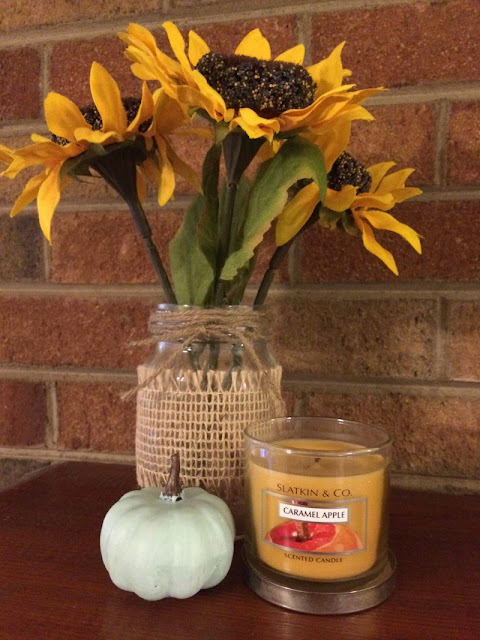 I used the mason jar as a vase for the faux Sunflowers, which is my favorite fall flower! 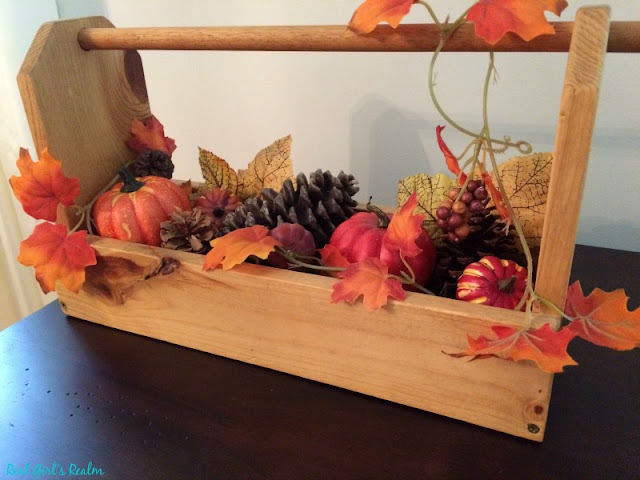 I brought in some wood for an organic feel by using a wooden block to give the mini pumpkin some height and added a rustic wooden pumpkin a got for a couple bucks on clearance at the end of the season last year. 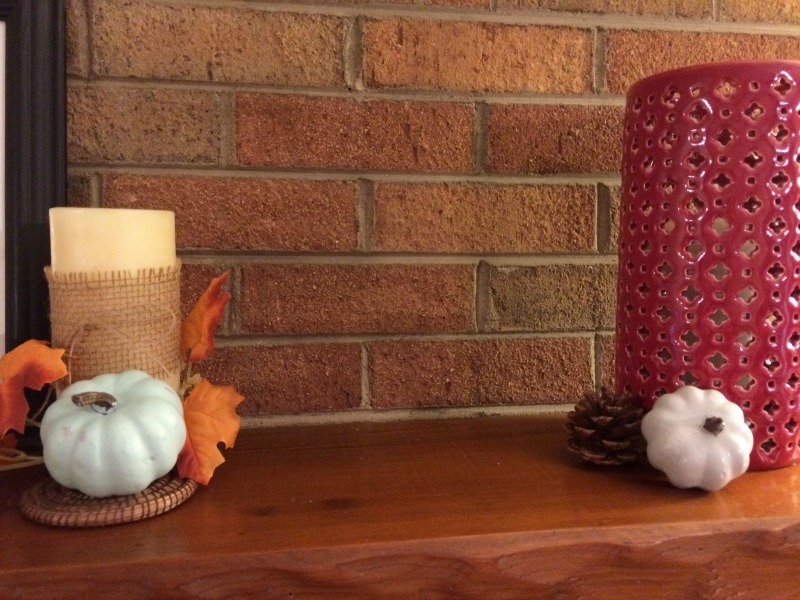 A caramel apple candle and some pine cones are the perfect finish to this rustic fall mantel. I also want to share this easy centerpiece I made using a wooden toolbox. I started with a bed of faux moss, then added some more of the leaf garland. I got this at the Dollar Tree and it comes in sections so you can use it over a large area or break it up like I did here. 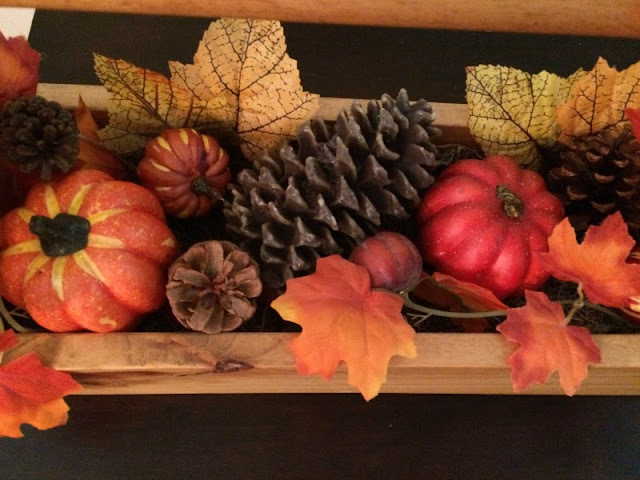 I then arranged some mini foam pumpkins and pine cones in the toolbox around the garland. I stuck a few more single leaves in to fill in the gaps. This makes the perfect centerpiece and it took less than 10 minutes and $5 bucks of Dollar Tree supplies! I can't quite get into that autumn vibe yet. We don't decorate our homes for seasons in the UK. I'll go with candles though. I have an extra wooden toolbox at home (a company accidentally sent me 2 when I was getting a gift for my husband) and this is such a cute idea! I was wondering what I should do with it. 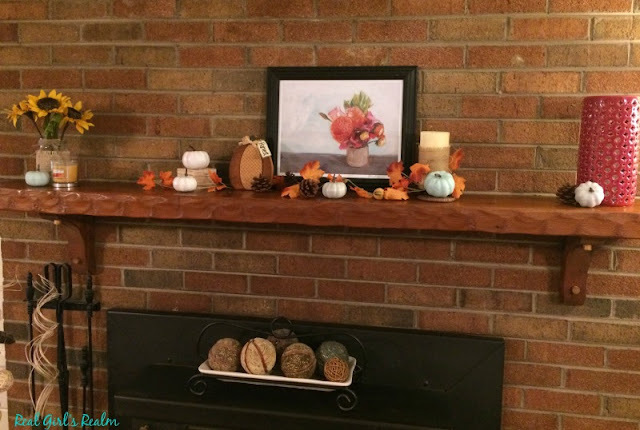 I just decorated my house for the fall, too! Yours looks lovely! Thanks Carrie! I can't wait to see what you do with yours. I bet it will be beautiful! I haven't even started decorating for fall yet. I may skip it this year! Haha! I feel that way at times! Oooh! I am so excited it's Fall time, just about. See ya later Summer! I don't know how to decorate thou - it's overwhelming to me, lol. 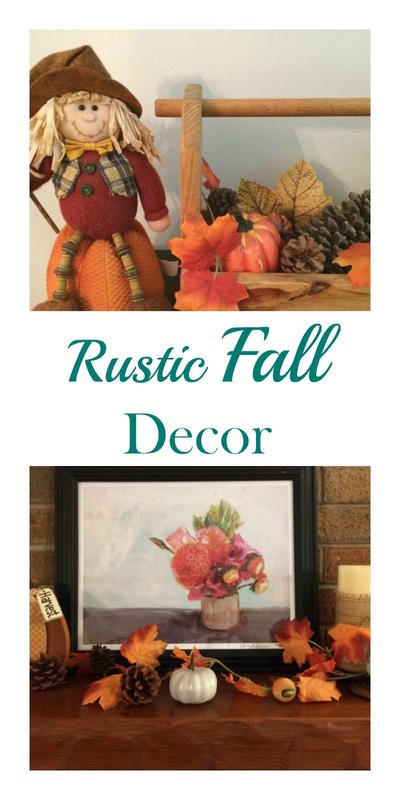 I am excited for Fall too and I am sure you can decorate!